Another in the pantheon of remarkable characters to have played for the Carlton Football Club since 1864, Ernest Clyde Cowley was awarded an international sports medal in 1944 for developing a new code of football he called “Austus.” Combining the unique features of Australian and American football, it encouraged its players to kick - and throw - a composite ball long distances, and for a while created a lot of interest in Melbourne during the last years of World War II. Prior to that however, during World War 1, Crowley had been a dangerous and productive full-forward for VFA club Brunswick, and later, for Carlton. 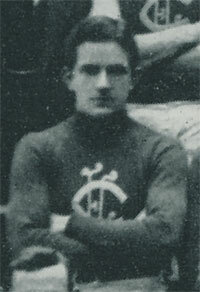 In the first of his two seasons for the Blues in 1918, he was the club's, and the league’s leading goal-kicker. Over summer, he was also an outstanding baseballer who represented Victoria at interstate level for many years. When he retired from the field, he became the baseball editor for the Sporting Globe newspaper, while retaining a life-long passion for both sports. Born in East Brunswick, just on the other side of the railway freight line that passed north-east of Princes Park, Cowley grew into a keen athlete who was Brunswick’s main attacking weapon in the bleak years of the Great War. During that time, the Blues tried many times to lure him into navy blue, and in 1918, they finally succeeded. Cowley’s first match for his new club was not a happy experience. Carlton started the season with a visit to Victoria Park, and were hammered by the Magpies by 35 points. Wearing guernsey number 17 and playing on a half-forward flank, Cowley was hardly sighted. Indeed, he didn’t find his feet properly or kick his first goal until round three against St Kilda, when the Blues clicked into form to beat the Saints by 38 points. A week later, Blues coach Norman Clark shifted Cowley to full-forward, and surely was impressed by the speed and cleverness of his new spearhead, who kicked three of his team’s eight goals against Essendon. From then on, the goal square was Cowley’s domain. He kicked four majors - or more - on five occasions throughout the year, and his season tally of 35 goals edged out Gerald Ryan of South Melbourne (32 goals) and Jimmy Freake of Fitzroy (29) as the competition’s leading scorer. Carlton finished the season well in third place on the ladder, only to lose a thrilling Semi Final by five points to eventual Premiers South Melbourne. As so often happens, the second-year blues took their toll on Cowley in 1919, beginning when he was injured in round 1 and missed the next three games. On his return his scoring rate dropped away, his confidence was affected, and he was omitted from the team after round 14. Carlton made the finals again, but were knocked out of contention by Collingwood, and Cowley finished up at the end of the season. Twenty-four years later, while working for Melbourne’s popular Sporting Globe newspaper, Cowley became heavily involved in organising sporting and social events for the thousands of American troops temporarily stationed in Melbourne on their way to war in the Pacific. He devised a game in which the American style of throw passing, and the Australian skill at kicking could be combined, and called it Austus. From late 1943 right through to near the end of the war in August, 1945, Austus matches were regularly held in Melbourne and Geelong, attracting large crowds for the benefit of various war charities. However, with the coming of peace at last, and the departure of the troops for home, the game soon petered out. Still, Cowley’s vision and energy were rewarded when he was presented with a medal in 1944 by the US-based Helms Athletic Foundation, in recognition of his work with the hybrid code. Throughout the rest of his long and busy life, Ern retained his interest and his involvement in his chosen sports - right through until his passing, at the age of 83, in October, 1975. View a clip of AUSTUS, filmed at Punt Road. Medal For "Austus" Inventor; New York, Tuesday AAP. Mr. Ern Cowley of Ivanhoe, a former Carlton footballer and interstate baseballer, has been awarded the Helms Athletic Foundation medal for a noteworthy contribution to sports through the invention of "Austus" football, combining features of both Australian and American football. The American Marine, Private William Jost, leading Austus player in the Pacific theatre, was also awarded a medal. He excelled at throwing the ball, his best distance being 76 yards, 1 foot, 6 inches. Article from The Gateway (Port Adelaide) October 11 1946 (p2) about Ern Cowley and the kicking and throwing contests between Australian footballers and US troops in 1943. Contributors to this page: blueycarlton , Bombasheldon , molsey , PatsFitztrick , tmd1 , true_blue24 , Jarusa and admin . Page last modified on Sunday 15 of July, 2018 15:31:13 AEST by blueycarlton. 1991 - Dunstall's top 10 players in the AFL; Williams, Kernahan & SOS. 2001 Elim. Final Match Preview Vs Adelaide.